ORLANDO – Bishop Ken Carter is encouraging churches across the Florida Conference to welcome gays and lesbians in worship and ministry. At a regularly scheduled gathering of St. Luke’s UMC’s Lesbian, Gay, Bisexual and Transgender cluster group Thursday, Carter encouraged United Methodists to welcome people of all sexual orientations with a spirit of “generous orthodoxy.” The full 5,000-member St. Luke’s congregation and clergy from other churches were invited to hear the message. "Since arriving in Florida, I have been approached by pastors of some of our most fruitful churches, seeking a conversation about this topic,” Carter said before addressing the St. Luke’s gathering. “When churches begin to reach their communities, and especially when they begin to connect with younger generations, the question of our mission with gay and lesbian Christians and their families is not political or ideological; it is rooted in pastoral relationships and in the desire to share the good news of Jesus Christ. "Once I began to reflect on this and felt led to contribute to the conversation, I realized that sharing with a local church would be an appropriate first step, followed by publishing a more general statement to a broad audience." 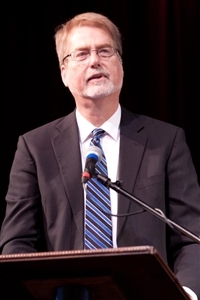 The bishop noted in his remarks that he was speaking in a pastoral and missional context, not in legal or political terms, and he was not advocating a break with the denomination’s Book of Discipline, the principles of which he has promised to uphold. His statement did not address issues of ordination and marriage that have been debated in recent years. To read the statement, click here. Dr. Bill Barnes, lead pastor at St. Luke’s, said he was “overwhelmed” that Carter wanted to convey such a message and that he chose St. Luke’s to deliver it. The pastor said his church has long had people of all sexual orientations in leadership roles and on staff, and some grew emotional when they learned of the bishop’s impending visit. He added that he sees the statement as a call to extend a “grace-filled welcome” to all people, regardless of ethnicity, age or walk of life. Note: Comments on this article are now closed.